We all know about how in modern politics the establishment of simple propaganda narratives is far more important than stuff like presenting dry facts and statistics aren't we? A basic understanding of how public discourse can be controlled and manipulated through simple propaganda narratives and carefully considered management of the news agenda is all that is needed in order to see how the post-Brexit Blairite coup attempt against Jeremy Corbyn is a disgustingly self-serving betrayal of the entire Labour movement. It is undeniable that the immediate aftermath of significant events is where public opinions (folk truths) about those events are solidified. Once widespread public opinions have been set, it takes an awful lot of effort to try to change the narrative to a different interpretation of what the events actually meant, and who was to blame for them. Everyone in the Labour Party should be well aware of this stuff from the way the Tories and the right-wing media capitalised on Liam Byrne's idiotic "no money left" joke note that he left at the treasury back in 2010. In the aftermath of the 2010 General Election the right-wing media used it as "evidence" that the Tories had to take over because Labour had incompetently squandered all the money. The facts that the very concept of "spending all the money" in a country that has monetary autonomy is economically illiterate, and that the note was clearly a joke became totally irrelevant. The simple "incompetent Labour - competent Tories" propaganda narrative was established and set as a political folk truth. A look at the facts tells us that Brexit came about because of the Tories. It's David Cameron's fault because he decided to gamble the entire future of the UK in order to gain a bit of short-term political advantage at the 2015 General Election, then lost the bet. And it's the fault of hard-right Tory MPs like Boris Johnson, Iain Duncan Smith and Michael Gove for repeatedly lying to the public to sell Brexit as a cure-all elixir to all of society's problems, when they clearly didn't even have a plan of action prepared in case they actually won. As we know from the Liam Byrne note, the facts are nowhere near as important as establishing a good simple story to explain events in the way that ordinary people can grasp. If this can be done quickly, the narrative can be set firm and there's pretty much nothing that can be done to retroactively undo it because folk truths are pretty much impermeable to things like facts and evidence, and few people are interested in revisiting "old news". What Labour should have done after Brexit was to speak with a united voice that culpability for Brexit lay with the Tories. That the blame lay wiith David Cameron for gambling with the nation's future for a little bit of short-term political advantage, and with the hard-right fringe of the Tory Party for repeatedly lying to the public in order to get a result that they were clearly completely unprepared for. 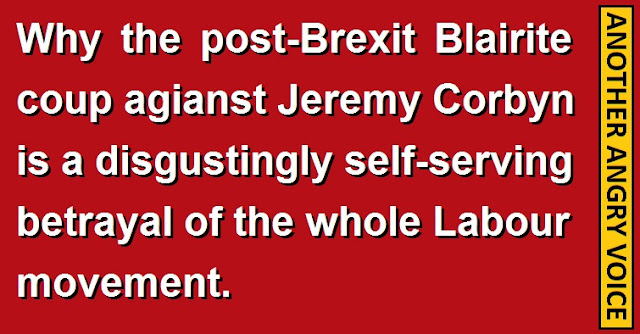 What these appallingly self-serving MPs decided to do instead was to establish a counter-narrative to dominate all the headlines and become set as a political folk truth; that Brexit is all the fault of the Labour Party and specifically Jeremy Corbyn! The Blairite right of the Labour Party should surely know the importance of establishing simple narratives and carefully controlling the news agenda better than anyone. After all, the slick soundbytes, the blizzards of PR, the stage management of the news agenda and the tactic of feeding pre-prepared articles to the press to be churnalised by lazy hacks were the hallmarks of Blairism. 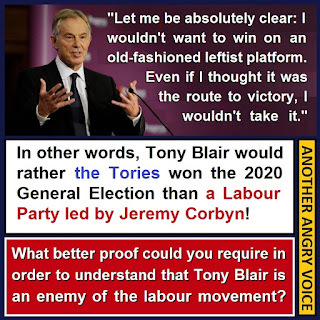 Tony Blair, Alistair Campbell, Peter Mandelson and the like were so successful because they were experts in managing the media, and public opinion. That was their great strength. To see a bunch of Blairite followers failing so spectacularly at managing the news agenda is about as clear a demonstration as possible that Blairism is well and truly dead. His acolytes don't even seem to understand the single most important aspect in their idol's success! 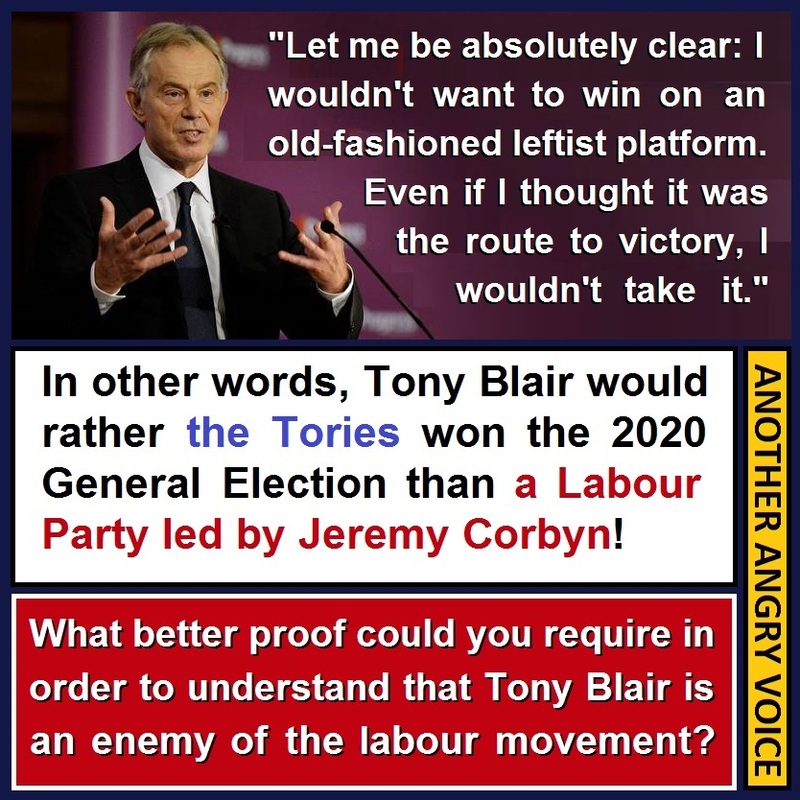 What these Blairites have done should be considered absolutely unforgivable by anyone who cares about the long-term success of the Labour Party (or anyone who simply wanted the country to have a viable opposition to the Tories) because in putting their own self-interest first, they've completely ruined the best opportunity to hit the Tories where it hurt in decades. These self-serving MPs have been waiting for an excuse to oust Jeremy Corbyn since the day he was elected leader because he represents a threat to the cosy Westminster orthodoxy, but by doing it now they've set a counter-narrative that Labour and Corbyn are more to blame for Brexit than the Tories. 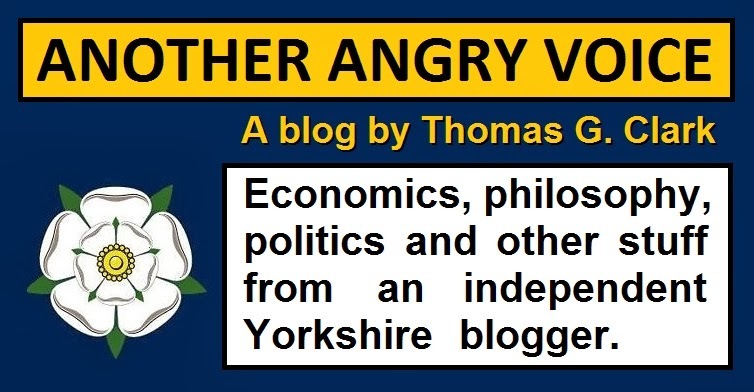 Not only have they undermined the best criticism of the Tories that Labour have had in decades by giving the right-wing an easy counter argument that Labour are to blame, they've also given the Tories and the right-wing media ammunition against Labour that can be used in its own right. When these Labour MPs got together and decided that a coordinated mass resignation would be the best way of toppling Jeremy Corbyn, they clearly didn't even bother to think about the damage they would be doing to the Labour Party by launching a coup attempt as such an inopportune moment. They were clearly too giddy with excitement that the opportunity they'd been waiting for for ten months had finally come about, to even bother considering the wider ramifications of what they were doing. It's flabbergasting that after the Tory party have allowed their own internal spat to escalate to such an extent that the UK has been dragged out of the European Union with a mandate from only 36% of the eligible electorate, these self-serving Blairites have decided to replace that ideal subject matter for the news agenda with reports on the spat within the Labour Party instead. There's nothing wrong with believing that Jeremy Corbyn isn't the right man to lead the Labour Party. Everyone is entitled to their opinion. But there is definitely something wrong with not even letting the common narrative that "David Cameron and the Tories are at fault for Brexit" set, before trying to challenge Corbyn's leadership for their own self-serving purposes and establishing a widely repeated counter-narrative of "Blame Labour, blame Corbyn". By launching their opportunistic self-serving coup now, the Blairites have helped the Tories climb out of a hole of their own digging, and voluntarily shoved the Labour Party down there in their place. These people are venal self-serving fools, who clearly consider their own ideological vendetta against Jeremy Corbyn to be far more important than the best interests of the Labour Party, or doing the job they're supposed to: Actually opposing the Tories.